Francis I possibly commissioned this portrait in connection with his second marriage, to Eleanor of Austria, or in commemoration of a meeting with King Henry VIII of England. During his long reign (1515-1547) Francis established France as a center of the arts and attracted many famous artists to his court, including Leonardo da Vinci, whose last years were spent there. 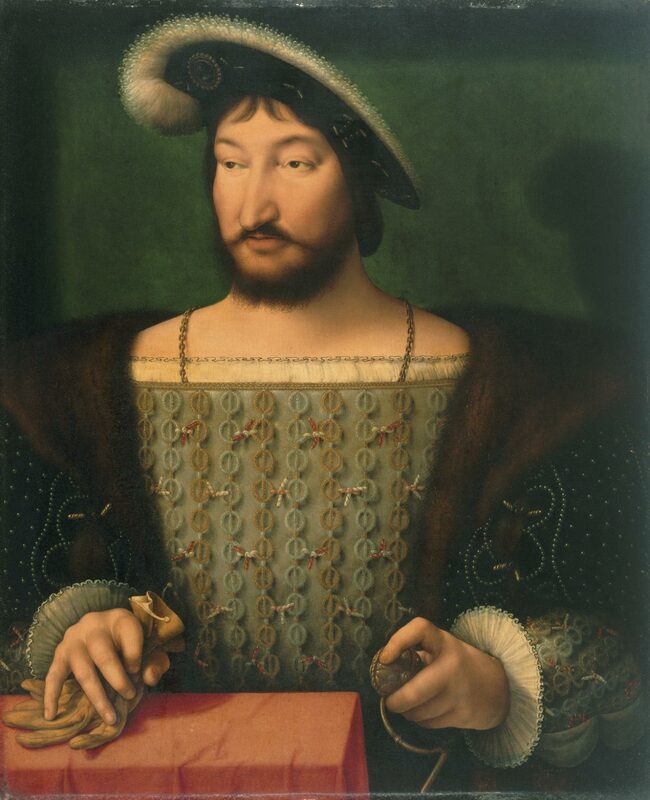 Francis I, king of France from 1515 to 1547, summoned Joos van Cleve to his Parisian court to paint his portrait around 1525, when the monarch was about thirty years old. In this royal portrait Joos, who was acclaimed for his painterly and coloristic abilities, emphasized the play between the three-dimensionality of the king's face and hands and the flat, decorative patterning of his costume. Francis is strongly illuminated from the right so that his body casts a strong shadow behind him, securely locating his form in space. Similarly, his hands are modeled with exquisite attention to the way that light falls across them and to their location in front of Francis's body. This heightened spatial illusionism is challenged by the ornate elements of the king's richly decorated and bejeweled costume, which is painted almost like a flat enameled surface. Unlike Francis's elaborate costume of state, Joos did not idealize his face and even emphasized its more homely aspects. Indeed, his large, coarse features and sly expression contrast with the formality of his dress and betray the man behind the head of state. Francis was a great patron of the arts, and the Museum is particularly rich in architectural elements and decorative arts created during his reign. Katherine Crawford Luber, from Philadelphia Museum of Art: Handbook of the Collections (1995), p. 170.